Nearly 30 percent of the bedrock in the Mountain Resources Commission (MRC) region is made up of granitic bedrock and granitic gneiss bedrock, with both rock types originating as molten magma that intruded into the Earth’s crust and then cooled. The granitic rocks are the younger of the two and did not metamorphose during the Paleozoic, so they are characteristically unlayered and more uniform in appearance. In contrast, the granitic gneisses are subdivided into two groups: Proterozoic granitic gneisses that are around 1 billion years old and are part of the ancestral North American continent that forms the core, or “basement,” of the Southern Appalachians; and the 500- to 300-million-year-old granitic gneisses formed during the Paleozoic mountain building events. The minerals of the granitic gneisses are essentially the same as those in the granites, but the gneisses have a banded or layered appearance imparted by the heat and pressure of metamorphism. Characteristics of the granitic and granitic gneiss bedrock can be advantageous or detrimental, depending on the circumstances. For example, these rocks typically weather to produce sandy soils, a benefit to the apple-growing region of Henderson County, but they can also create conditions suitable for high levels of erosion on steep slopes. These rocks are typically hard and resistant and are thus valued for their durability. 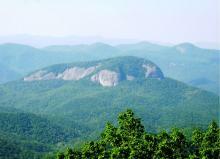 They form striking features on the landscape, such as Chimney Rock, Hickory Nut Gorge, Looking Glass Rock, and Stone Mountain, among others. They also produce valuable construction materials, including aggregate and dimension stone. The strength, durability, and uniformity of the Mount Airy granite in Surry County make it a world-class dimension stone resource. 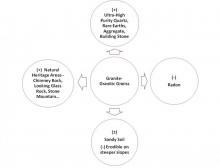 The major constituents of granitic bedrock include feldspar, mica, and quartz, which can serve as important economic resources, especially in the Spruce Pine area. Other minerals like monazite can make granitic rocks, and the placer deposits derived from them, potential sources for rare earth minerals. Conversely, trace amounts of radioactive minerals found in these rocks can result in elevated levels of radon in groundwater. Radon in indoor air is a significantly higher health risk than radon in groundwater. Indoor air radon levels, however, are influenced by more factors than bedrock composition, a primary factor in radon levels in groundwater. 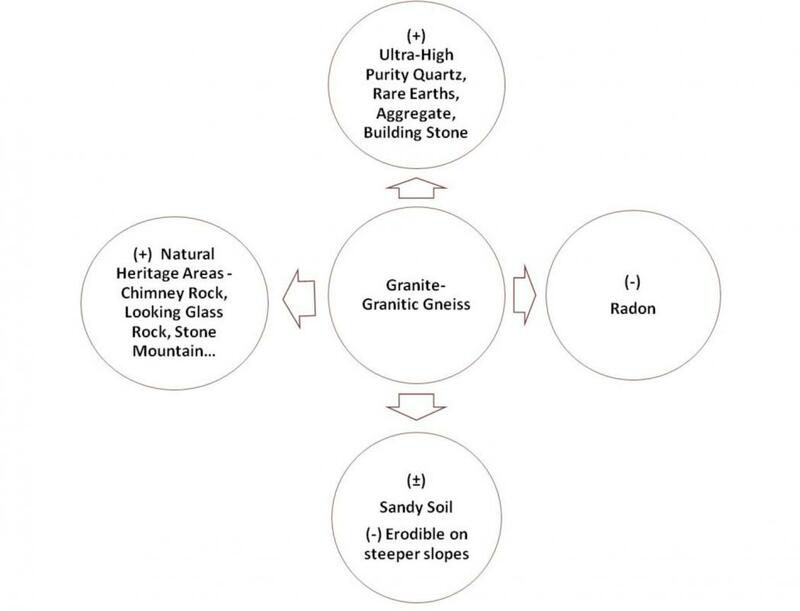 High and low levels of radon in groundwater can occur in most rock types; however, there is a significantly higher probability of groundwater radon in some granitic and granitic gneiss bedrock. In Western North Carolina, elevated levels of radon in groundwater within Jackson, Mitchell, Yancey, and Cleveland Counties are associated with the presence of granitic and gneiss bedrock. Paleozoic (younger) granitic gneisses also typically correspond with elevated radon in groundwater in Transylvania, Henderson, and Buncombe Counties, as well as northwestern Rutherford, southwestern McDowell, and southern Wilkes Counties. Proterozoic (older) granitic gneisses usually are not known to be associated with radon in groundwater, with an exception being some of these gneisses in Watauga County. Data are sparse in many locations, and more testing will likely refine the relationships between radon in groundwater and granitic and granitic gneiss bedrock. 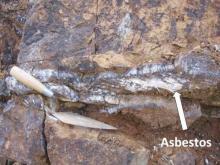 Areas of bedrock with acid-producing potential are common in the Blue Ridge Mountains of Western North Carolina. Much of the rock contains trace amounts of naturally-occurring iron sulfide minerals, such as pyrite (fool’s gold), usually occurring in concentrations below what’s necessary to produce harmful environmental impacts when exposed. 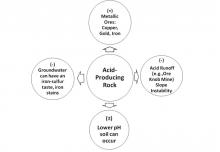 Other acid-producing rocks, primarily those among the metamorphosed sedimentary rocks of the western Blue Ridge, can contain sulfide minerals in concentrations sufficient enough to warrant mitigation measures when encountered during engineering projects. When exposed, oxidation and hydrolysis of the sulfide minerals can produce the damaging sulfuric acid with pHs as low as 2.5, and can weather the surrounding rock at accelerated rates. Excavations into unweathered sulfide-rich rock exposes areas containing the constituent minerals and then increases the potential for acid production, but is typically not a concern unless significant amounts of unweathered rock becomes exposed. 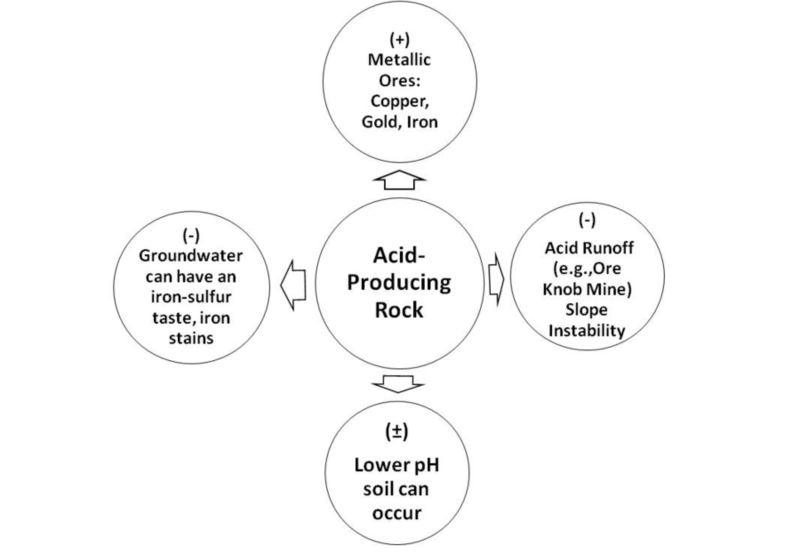 Produced acid can also serve as runoff throughout rock fissures and slopes that further exacerbates rock weathering, thus leading to rockslides and surface instabilities. When acidic runoff enters streams, sudden decreases in pH may occur and can degrade water quality, causing significant mortalities among acid-intolerant aquatic organisms, such as during the 1963 reconstruction of U.S. Highway 441 in the Great Smoky Mountains National Park. Acidic runoff is usually greatest shortly after road construction, but can continue at decreased levels years after construction. Mine waste and tailings from some abandoned mines can also produce damaging acid runoff, such as with the Ore Knob Mine in Ashe County. Similarly, acid-producing rocks can adversely affect the stability of slopes, particularly if untreated material is used in the construction of embankments, as was the case in the slope failures of Swain County in 2003 and Haywood County in 2006, or the road cuts contributing to rockslides on the Blue Ridge Parkway in 1999 and 2006. 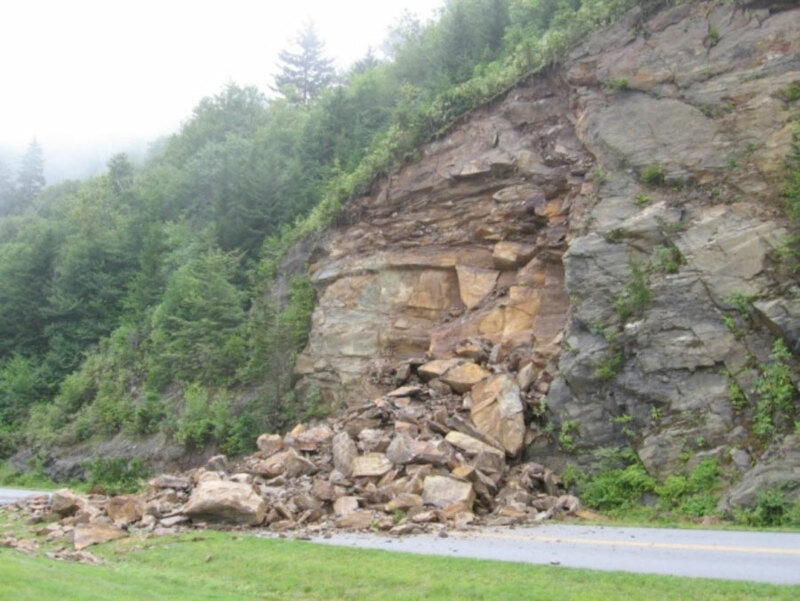 To avoid similar damage, the presence of significant amounts of acid-producing rock was a consideration in evaluating alternatives for the North Shore Road extension in the Great Smoky Mountains National Park in Swain County. Given these many concerns, well-established, standard engineering practices have been developed to isolate or neutralize acid-producing rock when encountered in construction. 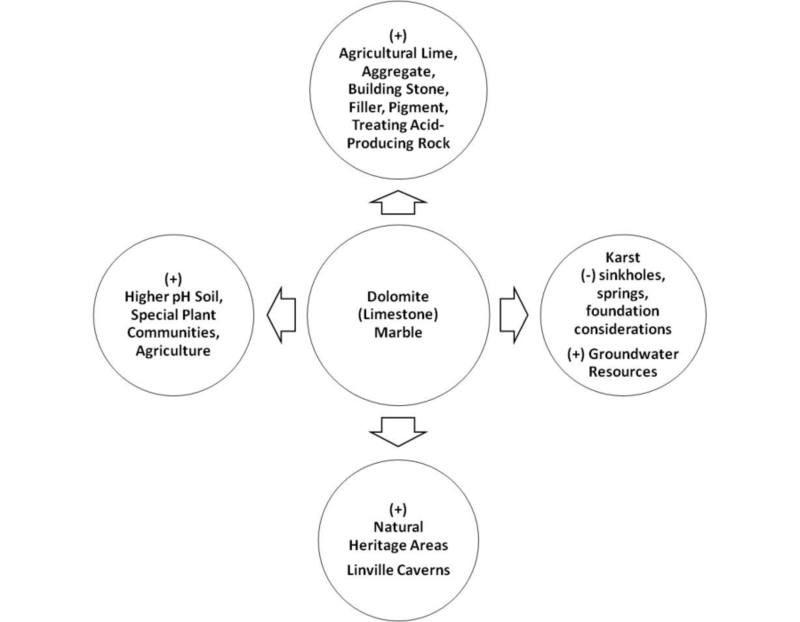 Limestone and marble occur in relatively minor amounts in the region; however, these deposits still act as important natural and economic resources. Mainly composed of calcium carbonate, they are often referred to as carbonate rocks. The potential for carbonate bedrock to contain underground cavities can make them good sources for large quantities of groundwater. These cavities may also cause sinkholes, which are not known to be a common problem related to the carbonate rocks in the region. However, unconfirmed reports indicate the presence of a sinkhole in Woodlawn, McDowell County, in the 1960s. Because the soil derived from these rock types has a higher pH than most mountain soil types, they can be beneficial for agriculture and can serve as host to naturally-occurring and tolerant plant communities. These limestone and marble deposits are used to make agricultural lime for agricultural soil improvements. Similarly, deeper soil horizons can develop over carbonate bedrock because it is more susceptible to weathering from acidic conditions compared to most other rock types in the region. 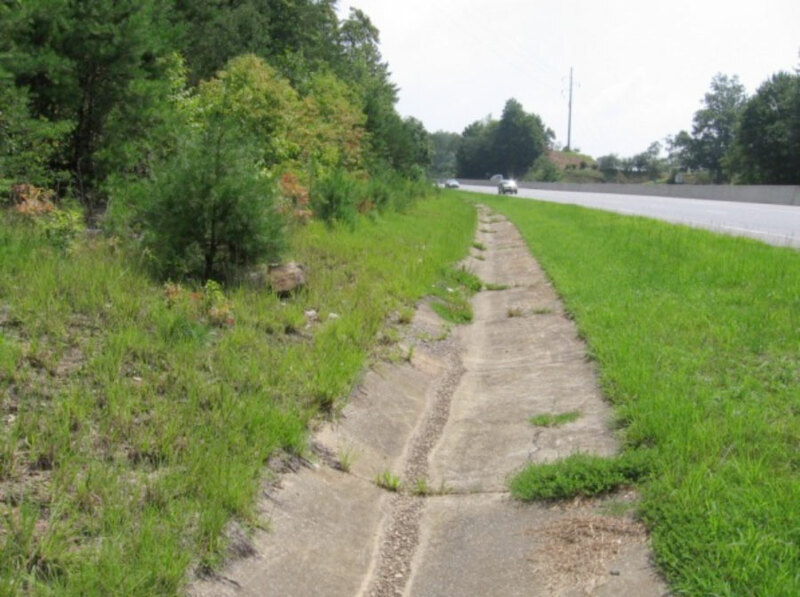 Although the thick soil can benefit agriculture and tolerant vegetation, it can be a destabilizing factor on steep slopes, a consideration when designing structural foundations. 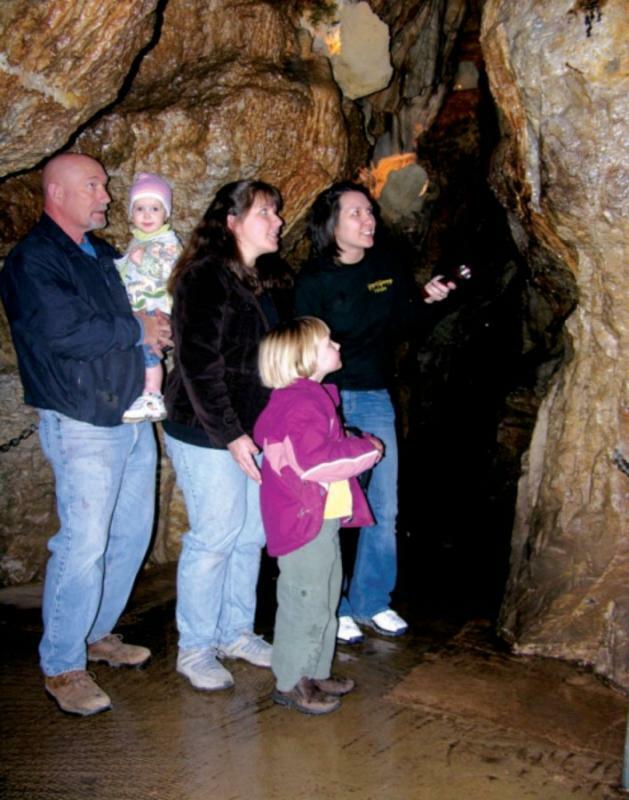 A magnesium-bearing limestone known as Shady Dolomite occurs in Madison and McDowell Counties, where the underground dissolution of the dolomite by groundwater formed Linville Caverns, a popular tourist attraction of McDowell County. The Woodlawn Quarry, also in McDowell County, produces aggregate, sand, and lime from the Shady Dolomite. Marble (metamorphosed limestone) is present in Western North Carolina as well, occurring locally along the Brevard Fault Zone (see Faults and Earthquakes). 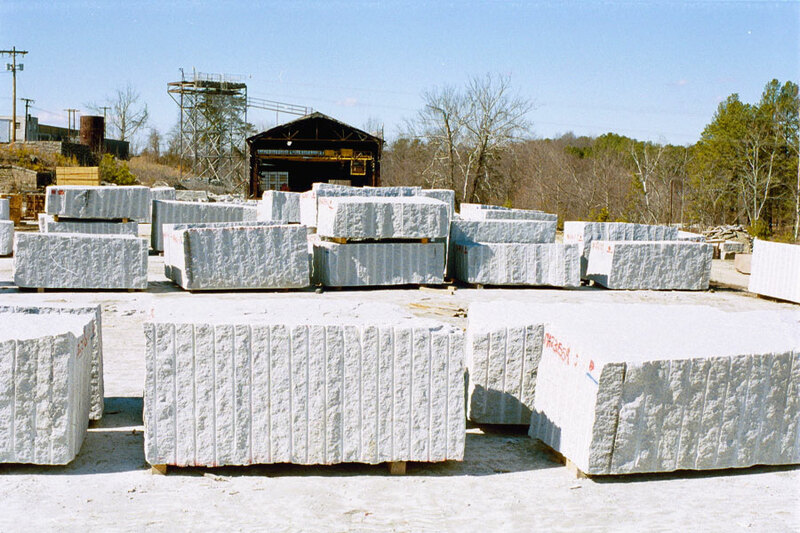 The Fletcher Quarry in Henderson County extracts this source of marble to produce aggregate and pharmaceutical materials. The Murphy Marble is mined in the Hewitt Mine in Swain County (see Mineral Resources), and other small marble bodies are found in Ashe, Jackson, Macon, McDowell, Mitchell, and Yadkin Counties. Although they are less common than other rock types in Western North Carolina, mafic and ultramafic rocks can be found in several counties of the MRC region. 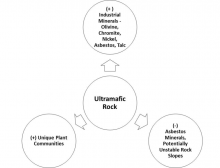 The terms mafic, ultramafic, and felsic refer to a rock classification continuum based on the relative abundance of certain elements. Felsic minerals, such as quartz, muscovite, and potassium feldspar, contain higher percentages of silicon, aluminum, potassium, and sodium. Mafic minerals, such as olivine, amphiboles, pyroxenes, and biotite, have higher percentages of iron, magnesium, and calcium (see Mineral Resources). These iron-, magnesium-, and calcium-rich minerals make mafic rocks heavier and usually darker in color than granitic and metasedimentary felsic rocks. 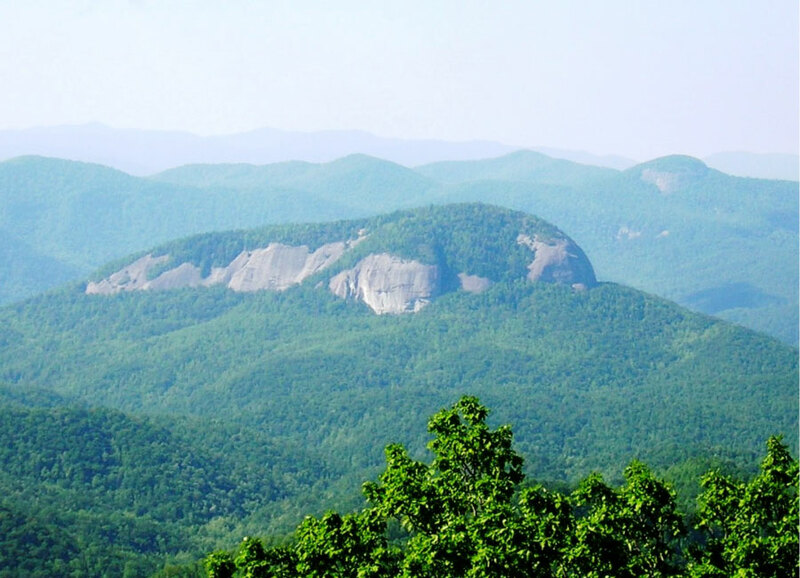 Mafic and ultramafic rocks in Western North Carolina are thought to be of igneous origin, although they were metamorphosed during the Paleozoic mountain-building events. Mafic rocks were the result of basaltic volcanism at the surface or igneous intrusions within the continental crust. Ultramafic rocks, such as dunite, serpentinite, and peridotite, are believed to have crystallized deep below mid-ocean ridges and form the base of the oceanic crust. Slices of the crust were sheared off and incorporated into the Appalachians during mountain-forming continental collisions. Ultramafic rocks commonly are associated with mafic rocks. Mafic rocks typically weather into deeper, higher-pH soils with higher concentrations of iron, calcium, and magnesium than typical mountain soil types, thus producing soil characteristics that benefit agriculture. Due to their chemistry, many ultramafic bodies produce high-magnesium soils that may be toxic to many plant species, preventing their establishment in certain regions. 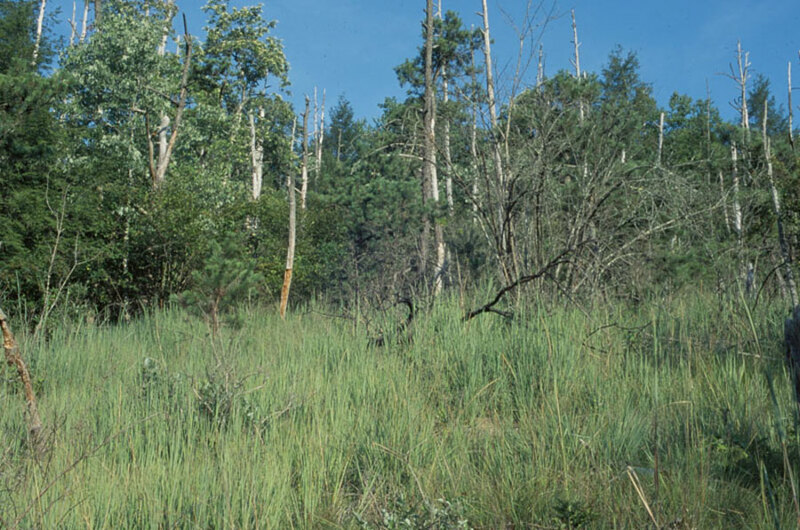 Areas underlain by ultramafic rock are often referred to as “barrens,” typified by stunted vegetation and dominated by magnesium-tolerant tree species, such as cedar and pine. These unique soil characteristics allow barrens to provide a home to rare or endemic flora and fauna that have adapted strategies for survival in such conditions. 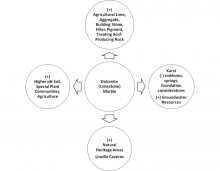 Economically, ultramafic bodies are important sources of olivine, talc, chromite, nickel, vermiculite, and asbestos minerals, all of which have been commercially produced in Western North Carolina. 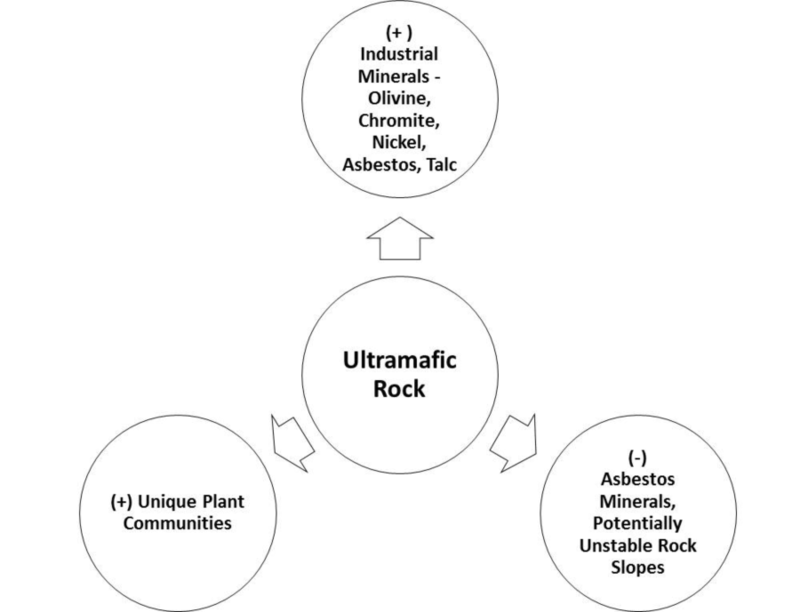 There are, however, potential hazards associated with ultramafic rocks. Because of the rock’s susceptibility to weathering and erosion and the presence of weak minerals like talc, these rocks can contribute to slope instability that can lead to landslide occurrences. 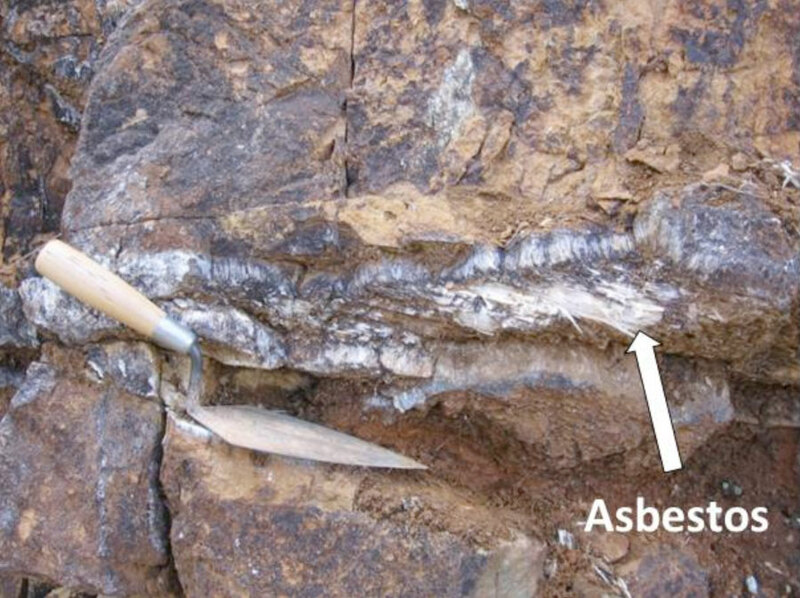 Similarly, excavating or disturbing asbestos-containing ultramafic rocks can expose the small, needle-like fibers to the environment, where inhalation or ingestion of these fibers can pose serious health risks. T.R. Campbell (Committee Chair). 2011. Final Report of the North Carolina Radon-in-Water Advisory Committee, March 9, 2011. 30 p.
North Carolina Geological Survey. 1985. Geologic Map of North Carolina, Scale 1:500,000 (out of print). Accessed from: http://gis.enr.state.nc.us/sid/bin/index.plx?client=zGeologic_Maps&site=9AM. Bryant, L., M. Mauldon, and J.K. Mitchell. 2003. Geotechnical problems with pyritic rock and soil. Blacksburg, VA: Center for Geotechnical Practice and Research, Virginia Polytechnic Institute and State University, 88 p.
Byerly, D.W. 1996. “Handling acid-producing material during construction.” Environmental & Engineering Geoscience II(1, Spring 1996), p. 49-57. Douglas, T.J., R.M. Wooten, K.A. Gillon, J.B. Bauer, J.C. Kuhne, R.S. Latham, A.C. Witt, and S.J. Fuemmeler. 2007. “Geohazard and Transportation Aspects of Sulfidic Rock (Acid Rock) in North Carolina.” In 7th Annual Technical Forum on Geohazards in Transportation in the Appalachian Region, Asheville, NC, August 1-2, 2007. Latham, R.S., R.M. Wooten, B.L. Cattanach, C.E. Merschat, and G.N. Bozdog. 2009. “Rock slope stability analysis along the North Carolina section of the Blue Ridge Parkway: Using a geographic information system (GIS) to integrate site data and digital geologic maps.” In Proceedings of the 43rd US Rock Mechanics Symposium and 4th U.S.-Canada Rock Mechanics Symposium, Asheville, North Carolina, June 28th–July 1, 2009. American Rock Mechanics Association, ARMA 09-171, 12 p.
Merschat, C.E. 1993. Geologic Maps of Cherokee, Graham, and Swain Counties, North Carolina. Unpublished North Carolina Geological Survey report to the USDA Forest Service, 10 p.
Schaeffer, M.F., and P.A. Clawson. 1996. “Identification and treatment of potential acid-producing rocks and water quality monitoring along a transmission line in the Blue Ridge Province, southwestern North Carolina.” Environmental & Engineering Geoscience II(1, Spring 1996), p. 35-48. Wooten, R.M., and R.S. Latham. 2004. Report on the May 5-7, 2003 Debris Flows on Slopes Underlain by Sulfidic Bedrock of the Wehutty, Nantahala, and Copper Hill Formations, Swain County, North Carolina. North Carolina Geological Survey Report of Investigation, 12 p. Accessed from: http://www.geology.enr.state.nc.us/Landslide_Info/pdfs/Swain_County_5_03_Debris_Flows_Rpt_2005_R2.pdf. Wooten, R.M., and R.S. Latham. 2006. 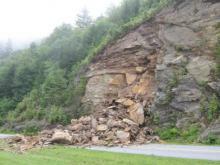 August 31, 2006 Embankment Failure – Debris Flow at the Cascades Development Haywood County, North Carolina. North Carolina Geological Survey Report of Investigation, 6 p. Accessed from: http://www.geology.enr.state.nc.us/Landslide_Info/pdfs/Eaglenest_Ridge_Debris_Flow_Final.pdf. S.G. Conrad, S.G. 1960. Crystalline limestones of the Piedmont and mountain regions of North Carolina. Bulletin 74. N.C. Department of Conservation and Development, Division of Mineral Resources. 56 p.
North Carolina Geological Survey. 1985. Geologic Map of North Carolina, Scale 1:500,000 (out of print). 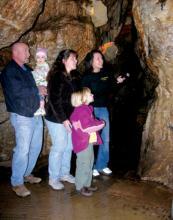 Accessed from: http://gis.enr.state.nc.us/sid/bin/index.plx?client=zGeologic_Maps&site=9AM).